While there are many advantages to using white in your home, one of the best reasons for choosing white is its amazing ability to reflect the maximum amount of light in a room. Aesthetically, white also creates a look that’s clean, simple and calm, but that too is a direct result of how well it amplifies natural and artificial light. 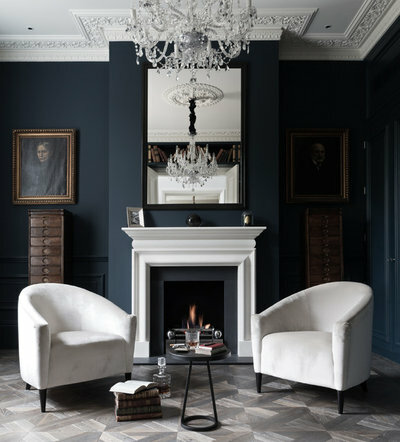 I’ve had clients tell me they want to paint the entire interior of their house white, but I often suggest they use this achromatic hue in more creative ways. You know, switch it up from room to room. By diversifying white in your home, you’ll reap the benefits of light while avoiding the trap of sameness. 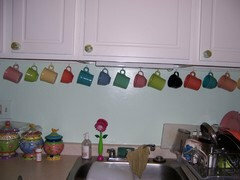 The best part: You’ll have limitless options for incorporating more vibrant, beautiful hues all around. 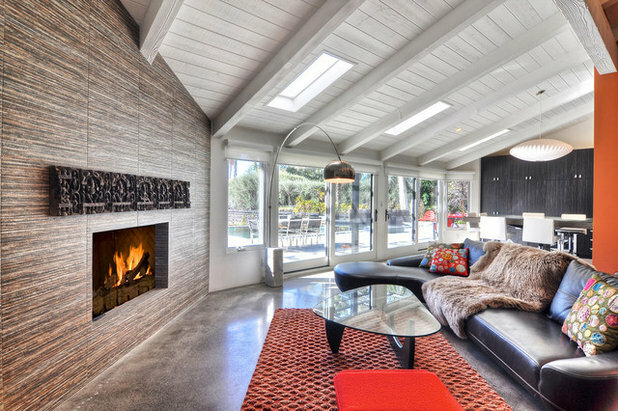 Here are some of the different ways you can weave white throughout your home. Make things pop. Dark rooms are super elegant and very relaxing. 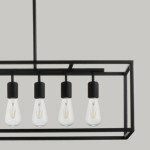 Unfortunately, they can also look dreary when lighter or brighter hues are absent. That’s not the case in this gorgeous deep-blue space. The white ceiling and oversized crown molding help to balance the wall color, while the white fireplace mantle and surround and the side chairs bring a modern accent to an otherwise traditional room. A similar paint color to try: Brilliant White by Ralph Lauren. Is Midnight Blue the New Black? Play up the details. 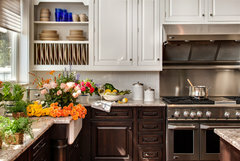 White cabinets brighten even the darkest kitchens and create a spacious look and feel. 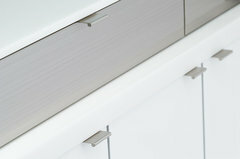 I think white kitchens are most interesting when fun details come into play. 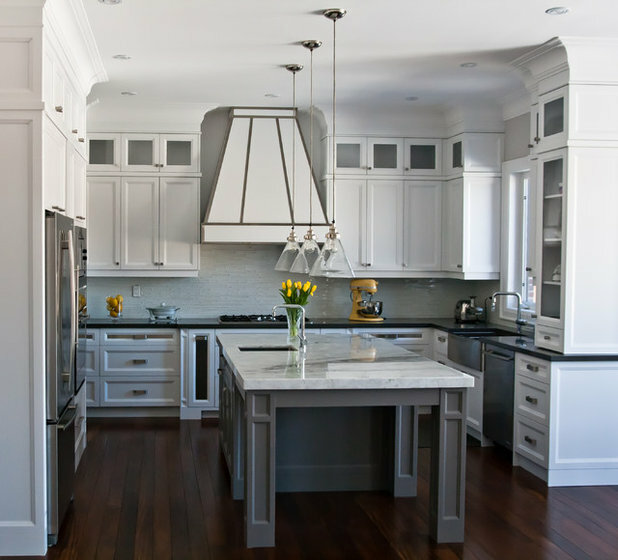 A few great ideas are evident here: You can frame out a white oven hood with a darker background, paint the island a different color or use dark flooring. I also love the bright yellow accessories. 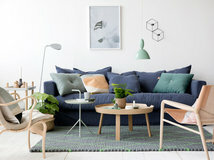 All of these ideas add personality and create a custom look. These paint colors are Oxford White and Metropolis (the island) by Benjamin Moore. Put the focus overhead. 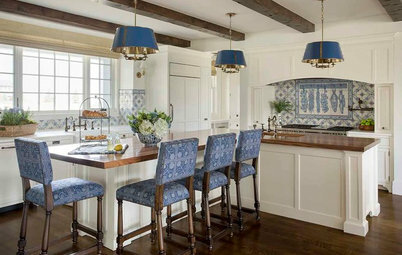 A wood beam ceiling can make a room. Some people prefer the appearance of natural wood, especially in a historic house. But if your goal is to lighten up your space, a well-considered coat of white paint on the beams can do wonders. And if you use one thin coat or a whitewash technique, you’ll preserve the lines of the grain so the wood still looks natural rather than hidden beneath layers of paint. 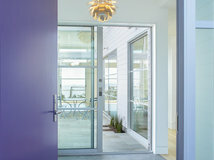 A similar paint color to try: Ultra White by Valspar. Go big with trim. Wainscoting isn’t commonly found in bedrooms, but doesn’t it look terrific here? The generous size of this wainscoting covers most of the wall, except where a pretty aqua peeks out at the top. And with such a lively mix of colors and patterns on the bed and floor, the wainscoting creates a perfectly simple background. 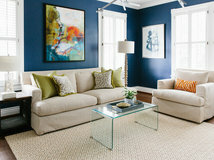 A similar paint color to try: Snowbound by Sherwin-Williams. 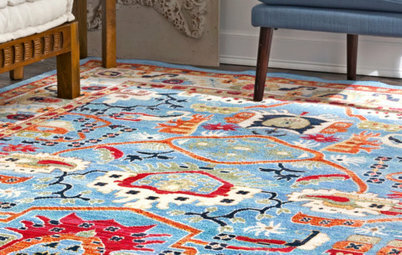 Be floored. White floors are alluring. They look fancy and casual at the same time, so they work nicely with a variety of design styles. I also love how they create the illusion that the furniture is floating. 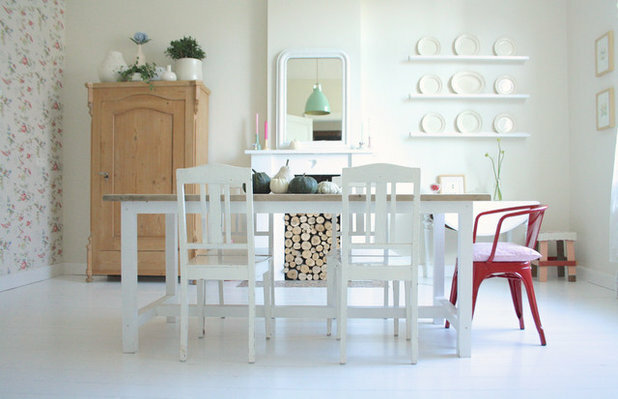 In dining spaces, white floors also lend themselves to brightly colored chairs. When painting wood floors, use a good-quality oil- or water-based primer before applying the paint. Finish the job with at least two coats of clear, gloss polyurethane. 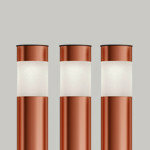 This will provide extra durability, especially in high-traffic areas. A similar paint color to try: Wimborne White by Farrow & Ball. Step it up. If you’re feeling the white floors, take it a step further and carry the look up the staircase. 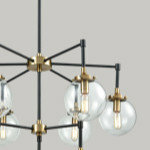 But take note: This is a very contemporary, almost futuristic look, so the usual bannister and spindles just won’t do. 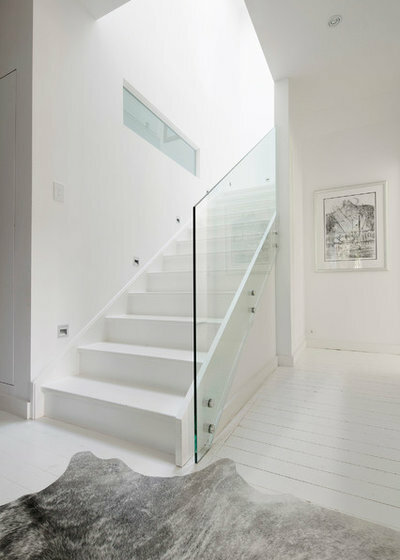 You’ll want to enclose the stairway with glass or acrylic. Now that’s heavenly. A similar paint color to try: White by Dunn-Edwards. Tile it on. 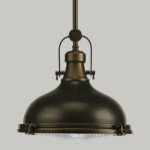 Subway tile is extremely popular these days and can help increase the value of your home. 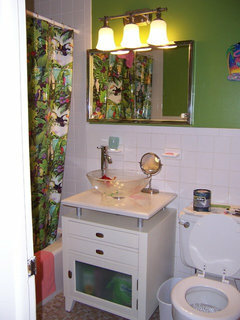 It’s an excellent way to incorporate white into your bathroom, but that doesn’t mean the entire room needs to be white. 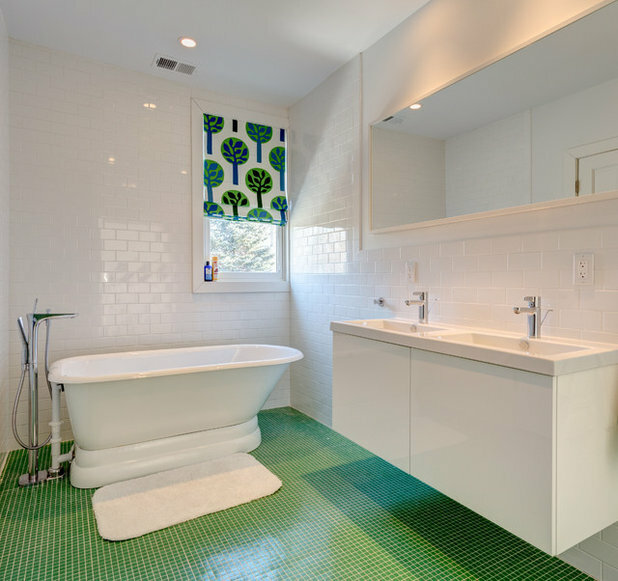 Introduce a different tile in a bold, unexpected color, such as the emerald green floor tile in this bathroom. And look how that adorable window shade ties the whole design together. The color makes this bathroom fun, and the white subway tile keeps it classy. Include the outdoors. Last, don’t neglect the outside and open-air spaces of your home. 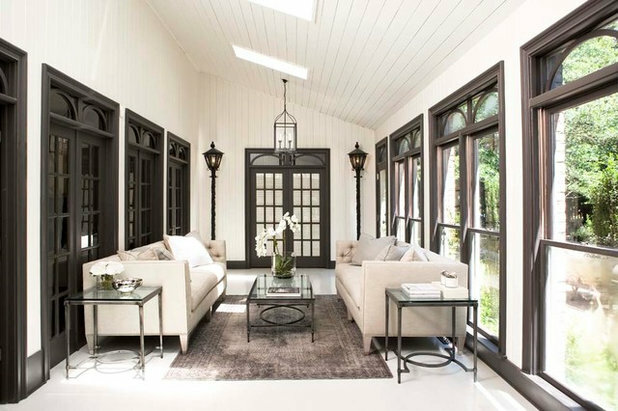 Your porch is an ideal place to go with an off-white, particularly if this area is very sunny, as a pure, crisp white could make things just too bright. For an elegant touch of contrast, paint the trim and doors black or dark gray. This paint color is Natural Choice by Sherwin-Williams. Tell us: What are the different ways you’ve used white in your home? Let us know in the Comments. 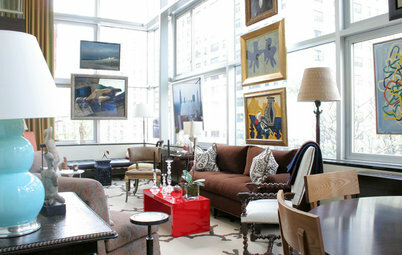 Portraits in the blue room at top are hung backwards for good composition. A portrait or photo should always be placed with the subject looking INTO the room, toward the center, facing each other and not OUT of the room (or off the page). They should be looking at each other, not the corners. 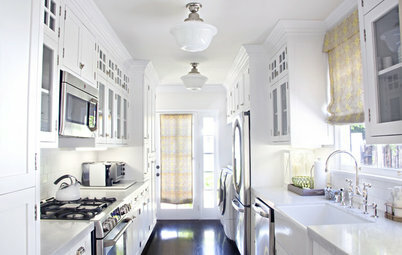 I love the crisp white cabinets brightening a small narrow galley kitchen. 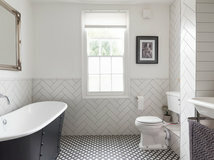 The white tiles and cabinet lighten a windowless bathroom.